Welcome to "I and the Bird's of Idaho", the 25th edition of the "I and the Bird" Blog Carnival. If anyone here is unfamiliar with blog carnivals, or the "I and the Bird" carnival, I suggest that you read this. We have some high quality and interesting content in this edition of "I and the Bird". Since I believe this is the first time that "I and the Bird" has visited the state of Idaho USA, I thought I would introduce you to the neighborhood. Lets begin the tour. 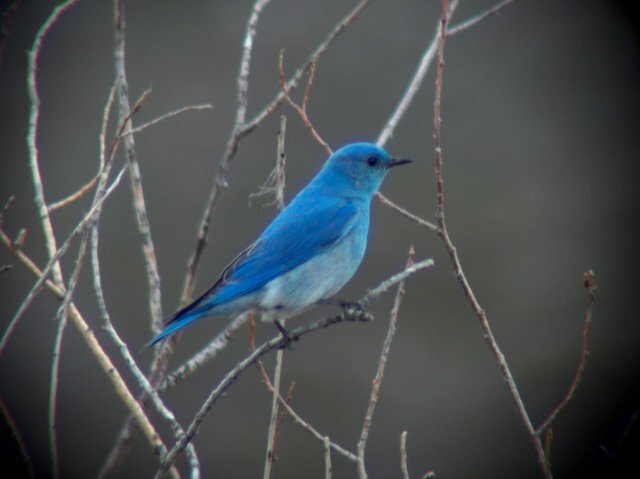 First, the Idaho Legislature in 1931 identified the Mountain Bluebird (Sialia arctcia) as the official state bird. Clearly a beautiful and remarkable bird, deserving of the honor. Idaho was the home of Morley Nelson. Morley Nelson was a falconer and educator. "He is best known as a seminal influence on raptor conservation in the Western United States". (wikipedia) In fact, up until his death in September 2005, he lived just a few blocks from my house. Morley is largely responsible for making Idaho the state of the raptor. Here is a great story about Morley and his impact. You can also check out his Biography Cool North Wind: Morley Nelson's Life With Birds of Prey by Stephen Stuebner. Southwest Idaho is home of the Morley Nelson Snake River Birds of Prey National Conservation Area, renamed by the Idaho Legislature after Morley's death in 2005. Morley was instrumental in getting this area established in 1971. The Morley Nelson Snake River Birds of Prey NCA is believed to be the largest density of raptors in the world. An estimated 800 pairs of raptors nest in the area. 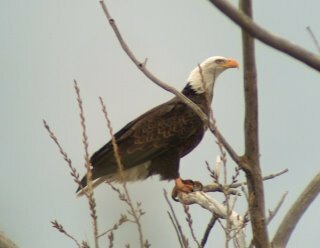 Sixteen raptor species nest in the area, including the American Kestrel, Ferruginous Hawk, Golden Eagle, Northern Harrier, Osprey, Prairie Falcon, Red-tailed Hawk, Swainson's Hawk, Turkey Vulture, Barn Owl, Burrowing Owl, Great Horned Owl, Long-eared Owl, Northern Saw-whet Owl, Short-eared Owl, and the Western Screech Owl. An additional eight species winter in the area, including the Bald Eagle, Cooper's Hawk, Gyrfalcon, Merlin, Northern Goshawk, Peregrine Falcon, Rough-legged Hawk, and Sharp-shinned Hawk. The large expanse of SouthWest Idaho desert, inside and outside of the conservation area, is teeming with ground squirrels, snakes, jack rabbits, and other rodents, providing an excellent food source for this community. Further emphasizing the raptor theme, and Morley's impact, Idaho is home of the Peregrine Fund. The Peregrine Fund deserves credit for bringing the Peregrine Falcon back from the brink of extinction, and even de-listed from the Endangered Species List! They have not stopped there, the Peregrine Fund operates the World Center for Birds of Prey, located near Boise, Idaho. The center provides the headquarters for the Peregrine Fund, but also its breeding program and educational arm. The local captive breeding program is having great success with other raptors - the California Condor and Aplamado Falcons. The center also operates breeding programs in Madagascar, Panama, and Greenland. More recently emphasizing our state's bird friendly nature, the 2006 Idaho Legislature passed a resolution supporting the development of an Idaho Birding Trail. The Idaho Birding Trail project is underway to create a descriptive map of the best birding locations in Idaho. Its objectives are to increase awareness of these locations for birding and wildlife conservation and to promote ecotourism throughout Idaho. I can't wait to check it out. The diverse landscape of the State of Idaho offers habitat for a large variety of birds. With 7 National Wildlife Refuges and the largest wilderness area outside of Alaska, there is ample opportunities for bird watching. Gray's Lake Refuge in Southeast Idaho has the largest nesting population of Sandhill Cranes in the world. I am sure there are many other interesting bird facts about Idaho, but I'll have to leave that up to the more educated residents. Now that you have the background on birds and birding in Idaho, lets get onto the main event. 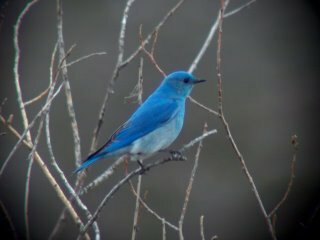 Here are the submissions for this edition of "I and the Bird", organized by the distance from my home town of Boise, Idaho. 8349 miles as the bird flies from Boise Idaho, Duncan of Ben Cruachan Blog #2 submits a story about his "old stamping ground" George's Creek. 6936 miles as the bird flies from Boise Idaho, David of Search and Serendipity did not submit a story, but gave me permission to choose one from his blog. I chose this one on Detail and mystery. 4843 miles as the bird flies from Boise Idaho, Tai Haku of Earth, Wind & Water blog, submitted this account of how the Easter bunny became associated with eggs in Easter bunny - take II. 4521 miles as the bird flies from Boise Idaho, Craig of Peregrine's Bird Blog submitted this story about Finally after three weeks a new bird for my year list. 2260 miles as the bird flies from Boise Idaho, Clare of The House & other Arctic musings submitted this story about family, friends, and how a morning can be highlighted by the Birdsong of the snow buntings. 2222 miles as the bird flies from Boise Idaho, Lillian and Don of Stokes Birding Blog were up to their usual work and submitted these amazing photos of the Crown Jewels of the avian world. 2152 miles as the bird flies from Boise Idaho, Mike of 10,000 Birds submits a story of his trip to see a true NYC rarity, a Fulvous Whistling-Duck, but was Left Whistling in the Rain. 2149 miles as the bird flies from Boise Idaho, Grrlscientist of Living the Scientific Life submitted an excellent book review of 101 Ways to Help Birds by Laura Erickson, illustrated by Roger Hall. Rob's note: if any of you are not already reading grrlscientist's weekly Birds in the News feature, you should be. Check her blog every Monday. 2052 miles as the bird flies from Boise Idaho, Aydin of Snail's Tales submitted these up close photos of the Tame birds of Florida. 1990 miles as the bird flies from Boise Idaho, Dan of Migrations submitted this story of the search for An elusive sparrow. 1858 miles as the bird flies from Boise Idaho, Rob of The Birdchaser submitted this story about finally fulfilling his quest to see a Fork-tailed Flycatcher. 1833 miles as the bird flies from Boise Idaho, the Journey Through Grace blog hosts some stunning photographs of how a baby mockingbird gets A full tummy. 1801 miles as the bird flies from Boise Idaho, John of Birds Etcetera (aka Bird Stuff) takes a unique look at how we birders are and are not considered by others in More Descriptive Terms for Birders. 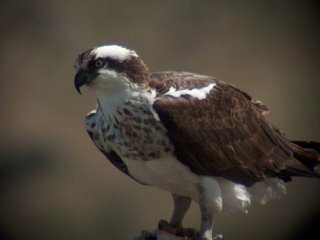 1146 miles as the bird flies from Boise Idaho, Sharon of Birdchick Blog submitted this fascinating, but Really Gross Eagle Post . It does have a very happy ending. 1120 miles as the bird flies from Boise Idaho, Jay of Ocellated submitted his story of My First Arctic Tern, In the Desert Of Course. 836 miles as the bird flies from Boise Idaho, Rick of Aimophila Adventures, submitted his account of seeing 45 species in Catalina State Park in Desert Summer. 696 miles as the bird flies from Boise Idaho, Leigh of "A bird in the hand is a certainty, but a bird in the bush may sing" presents her pictures of two adorable baby black-necked stilts. 691 miles as the bird flies from Boise Idaho, Amy of Wildbird on the Fly submits some great visuals to illustrate her point in Worth 1,000 Words. 664 miles as the bird flies from Boise Idaho, Jason of Beakspeak, the Big Bird Blog submitted this great report on his trip to the Eastern Sierra mountains - Snow, Sage, and Dancing Chickens. 573 miles as the bird flies from Boise Idaho, Eli of Left I on the News submitted this photo of Two Killdeer. I hope you are better than I am at finding the second one in the picture. 521 miles as the bird flies from Boise Idaho, Joe, posting at Interesting Thing of the Day, presents some very thought provoking perspectives on human stereotypes and Crows that Make Tools. 296 miles as the bird flies from Boise Idaho, Carel of Rigor Vitae: Life Unyielding submitted this encouraging and educational story about raptor health in A Pinedale Anticline Photojournal--Part II: The Raptors. 0 miles as the bird flies from Boise Idaho, I, here at Rob's Idaho Perspective have submitted my own account of visiting the Morley Nelson Snake River Birds of Prey Area. Enjoy this edition of "I and the Bird" and then write up your stories for the next edition. It will be hosted at The Hawk Owl's Nest on June 22nd. The deadline for submitting content is June 20th. Browse to the I and the Bird Home Page for information on submitting content and even hosting future editions of I and the Bird. Animated gifs of bird flying and waving were acquired through a link exchange with Pleasure Gait Farms. All other photos on this page were taken by me. Wonderful job Rob! Can't wait to dig into all these wonderful blogs. Another good one Rob, you'd better put out a bowl of water for that poor bird! Very nice, and I like the Idaho info, who knew? That bird does look tired though--what a long way. But a great collection, I'll be back for some serious reading! Great job! I've been meaning to get to Idaho one of these days... I'll be hosting next, please submit your articles to pbelardo AT yahoo.com. Great job, Rob! Thanks for slipping me in. I wasn't aware that the Snake River Birds of Prey Area had been renamed in honor of Morley. How wonderfully appropriate!